Week two of my January Challenge and the food from this week’s recipes have been nothing short of spectacular. The first week I found I was trying to re-create my favorite meat dishes without meat and was left a little disappointed. This week, I hit my stride though I haven’t had time to blog much. Personally, I like to blog about recipes in the order that I make them. Perhaps that is my apparently no-longer virgo self creating order. This week has been a week of great recipes. Really great recipes, so each day I say “oh I have to blog about this right now” and before I can finish the post I eat the next thing and I have to blog about the new recipe “right now!”. 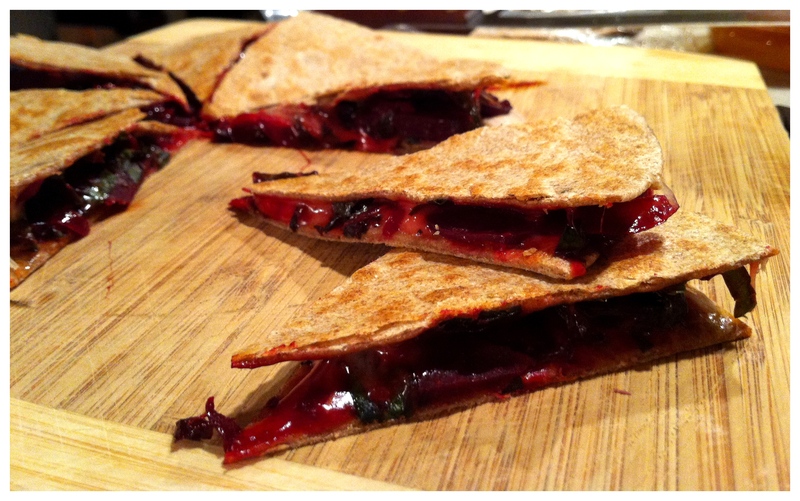 The recipe that tops them all (so far anyway, it is after all only Thursday) are these amazingly delicious, incredibly easy Beet and Green Quesadillas. I know, I know, beets on quesadillas? I was a bit skeptical when I first read the recipe too, and actually skipped over it the first time I flipped through the cookbook, but this may be one of the best things I’ve eaten recently. It is out of The Meat Lovers Meatless Cookbook by Seattle-based food writer Kim O’Donnel. These vegetarian recipes don’t leave you missing meat, they are substantial and full of amazing flavor. We had the quesadillas for dinner with a bowl of roasted red pepper soup and then I whipped up amazing lunch burritos with the leftover beet filling to take to work the next day. Very, very satisfying and so very flavorful. In other satisfying and exciting news, my Roasted Potato Curry was featured on FoodPress.com this week. If you haven’t already, you should check out the other awesome recipes featured! Welcome everyone who recently joined us, be sure to head over to our Facebook and Twitter pages to get more deliciousness from the RealFood kitchen! The key for tender beets is to slice them very thinly. I used my food processor and I’m not sure I would have attempted this recipe without it, since thickness is really important. I would strongly encourage you to use a food processor slicing blade or a mandolin. If you do give it a try by hand, let me know how it turns out. Worst case, you may have to cook the beets longer. With extra beet filling I made burritos to take for lunch the next day. I added some crock-pot cooked pinto beans for a little protein. Wrapped in parchment paper they could be warmed up in the microwave for about a minute and Alaina and I both agreed that this was one of the best work lunches we’ve ever had. Heat oil in skillet. Add onion and beet, cook covered for 6-8 minutes, until tender. Stir often. Remove from heat. In same pan with beet mixture removed and pan wiped out or in a separate pan, drizzle just a touch of oil in the bottom and lay tortilla in pan. 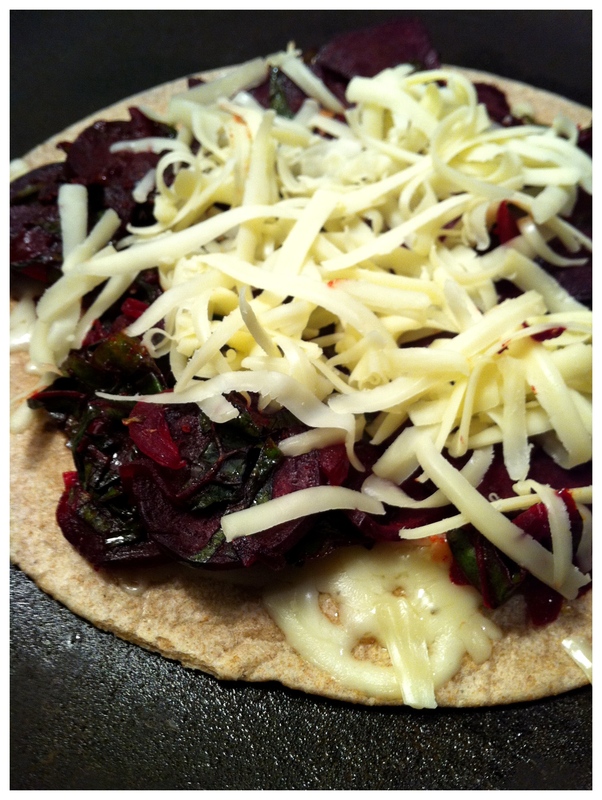 Sprinkle with 1/4 of cheese, top with half of the beet mixture, and sprinkle with another 1/4 of cheese. Lay second tortilla on top. Once cheese starts to melt flip quesadilla in pan to allow other side to brown slightly. Don’t over cook and burn. Remove from pan and cut into wedges. A pizza cutter works well. Repeat with remaining tortilla and beet filling. This entry was posted in Cookbook, Quick dinner, Recipe, Vegetarian and tagged Cookbook, Recipe, Vegetarian, Winter. Bookmark the permalink.